The U.S. Federal Aviation Administration (FAA) has granted 330-minute extended-range, twin-engine operations (ETOPS) approval to 14 CFR Part 33.201 for the GEnx-1B engine, which will power the Boeing 787 aircraft. The GEnx-1B engine completed all requirements to achieve 330-minute ETOPS, including a demanding 3,000-cycle ground endurance test in April. The FAA approval confirms the engine has demonstrated the required reliability to conduct ETOPS operations up to 330 minutes flying time from a primary or alternate airport. ETOPS approval provides airlines much greater route-scheduling flexibility as it allows twin-engine aircraft to service routes traditionally reserved for three- and four-engine aircraft. In October , the first GEnx-2B-powered Boeing 747-8 aircraft was delivered to Cargolux. 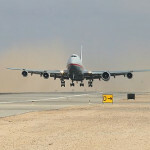 Since that time, five additional GEnx-2B-powered Boeing 747-8 aircraft have been delivered. With less than two months in service, the GEnx-2B engine has already completed more than 1,700 engine flight cycles. Based on proven GE90 architecture, the GEnx engine succeeds GE’s CF6 engine. Compared to the CF6 engine, the GEnx will offer up to 15 percent improved fuel efficiency, which translates to 15 percent less CO2. The GEnx’s innovative twin-annular pre-swirl (TAPS) combustor will dramatically reduce NOx gases as much as 55 percent below today’s regulatory limits and other regulated gases as much as 90 percent. Based on the ratio of decibels to pounds of thrust, the GEnx will be the quietest engine GE has produced due to the large, more efficient fan blades that operate at slower tip speed, resulting in about 30 percent lower noise levels. 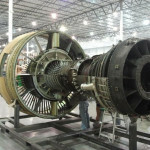 The GEnx will be the world’s only jet engine with both a front fan case and fan blades made of carbon fiber composites.